Investigators received an anonymous report of a paint horse in a sling in a barn, and a second horse with an injured, oozing eye, both reported to be in terrible shape. The two horses were not being fed regularly. There was a third palomino horse on the property that had been losing weight. On the first visit, the CHS investigator could only see one horse, which did not have access to water. 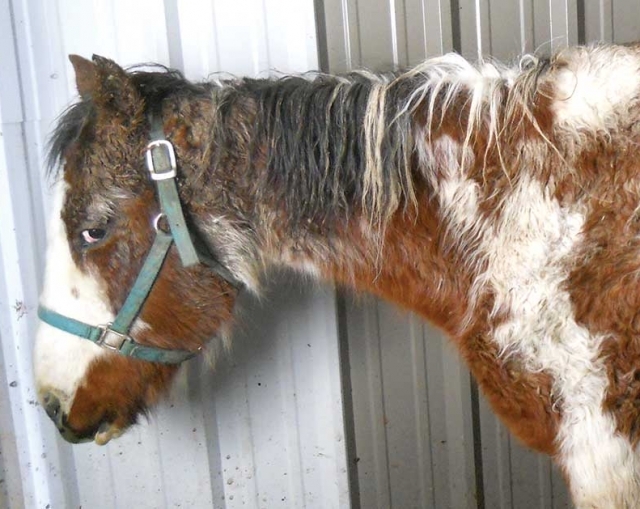 He returned with a deputy and saw the paint horse in very poor condition, and the horse with the bad eye also in bad condition. He made an appointment with the veterinarian and the owner. The CHS investigator, a deputy, and the veterinarian met again at the property to examine the horse with the bad eye. The vet made feeding and medical care recommendations. The investigator gave the owner a verbal warning to adhere to the vet’s recommendations and to stay in contact with CHS if unable to follow the vet’s instructions. The investigator followed up two more times. After a month of following the vet’s instructions, the horses were gaining weight.